Are you and your family at an increased risk for skin cancer? Are you at an increased risk for skin cancer? While anyone can be at risk for developing skin cancer, even people with naturally darker skin tones, some factors may put you at an increased risk for this disease. By learning what those factors are and what proactive steps you can take to protect yourself, you can lower your risk. What factors may increase the risk of skin cancer? Where you live: Of course the most significant risk factor is exposure to ultraviolet (UV) radiation. For that reason, where you live can increase your risk of developing skin cancer. Living in an area that has bright sunlight year-round or at a high altitude, where studies have found that the intensity of UV radiation increases 8 % to 10% per 1,000 feet of elevation, means your exposure to UV radiation and your risk of all types of skin cancers are greater. 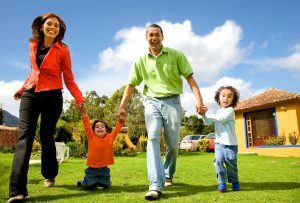 Family or personal history of melanoma or other types of skin cancer: If one of your parents, siblings, or children has been diagnosed with skin cancer, your risk of developing the disease is higher. Scientists can’t yet definitively say whether this is because of gene mutations that run in your family, a family lifestyle that includes a lot of time in the sun, the fact that family members are all fair-skinned, or a combination of these factors. If you’ve had skin cancer before, you are at an increased risk of being diagnosed with the disease again. People who’ve had basal or squamous cell skin cancers are also at increased risk for developing melanoma. Moles and certain skin lesions: People who have a large number of moles or a type of mole known as dysplastic nevi have a greater risk of skin cancer. Precancerous skin lesions called actinic keratosis, which look like rough scaly patches of skin that may range in color from brown to dark pink, also increase risk. A weaker immune system: People who have health conditions that weaken their immune systems, such as HIV or leukemia, or who have had an organ transplant and take drugs that suppress the immune system to prevent organ rejection are at an increased risk because the immune system helps fight the development and spread of cancer cells. Your age and gender: Older people, who have had more years of UV radiation exposure, are at increased risk. In addition, studies have found that men are two times as likely as women to have basal cell cancers and approximately three times as likely to develop squamous cell cancers. Radiation and chemical exposure and HPV infection: People who’ve been exposed to radiation to treat cancer or skin conditions such as psoriasis or eczema may be at an increased risk. Exposure to significant amounts of chemicals such as arsenic, industrial tar, coal, paraffin, and some types of oil used in industry may also increase the risk of developing the disease. Some research has also linked human papillomavirus (HPV) infection with an increased skin cancer risk. Lifestyle: People who smoke and those who use tanning beds, lights, or booths can face a higher risk. Certain medications: Medications that suppress the immune system, some steroids, some medications used to treat cancer, and some anti-fungal medications have been linked to an increased risk of squamous cell cancer. Ask your doctor if any of your medications may increase your risk and if there are effective alternatives you could consider instead. Damaged skin: Skin that’s been damaged by burns, disease, or sunburn may increase your risk of basal cell or squamous cell cancer if you have significant UV exposure over the course of your lifetime. Wear protective clothing, hats, and sunglasses and avoid the sun’s peak rays between 10 am and 4 pm as much as possible. Use broad spectrum sunscreen with an SPF of 30 or higher year-round and reapply it every two hours or after swimming or sweating. You need about one ounce of sunscreen, enough to cover your palm, to get adequate coverage. Check your skin monthly for any changes, such as new growths and changes in existing moles and freckles. You should also see your primary care physician or a dermatologist annually for a skin cancer check. A health advisor can help you find an experienced specialist who can assess your risk and build a strategy to lower that risk.